Early Retirement Extreme gets its own domain! Please update your bookmarks and RSS feeds if you need to. I hope I don’t lose anyone in the transition! Second, I would like to thank my readers for the positive comments. Knowing that some my blog entries are appreciated is very encouraging and makes me want to keep on writing. I figure if I can inspire just one person to do what I did, it will have been worthwhile. Of course, if I can inspire two persons, who in turn inspires two others, we will have a chain reaction. Regardless, it will be very interesting to see what eventually obtains from these writings. I began this blog a whole 3 weeks ago with the goal of filling a niche of personal finance. Whereas there is much focus on getting out of debt (in N easy steps) or becoming rich (preferably quick), there is less focus on quitting the rat race, adapting to simpler lifestyles, and letting your money work for you. Since there are a few of us out here for whom the latter makes eminent sense, I will continue writing on alternative ways of thinking about money, how to “produce” a solution rather than “consume” it (i.e. buy it), and various tips and tricks that save money and time. Hopefully, I will finish setting up this new site soon so we can get back to the regular schedule. 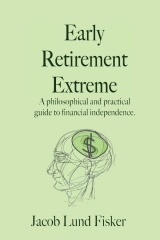 2 users responded in " Early Retirement Extreme gets its own domain! " You lost me, but I found you again! Your previous post was the last one delivered to my RSS reader, so I didn’t know the domain had changed until I just happened to look you up recently. No problem, I’ll just catch up on the posts I missed, and you’ll probably be on this domain for quite a while. At least a year, that’s what I prepaid for anyway. Sorry about the mix up. I was hoping that I got everyone transferred painlessly. It seemed to work for some readers/browsers and not for others.